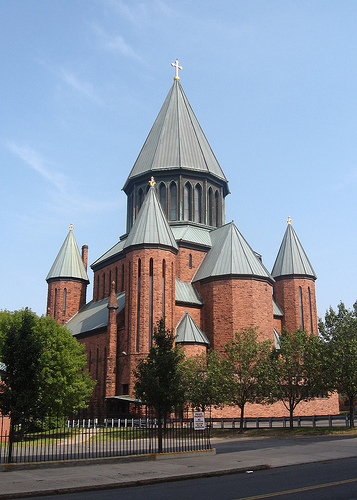 This unique church, built around 1899, was designed by Monsignor John L. Reilly from ideas he had gathered while visiting churches in Europe. Edward Loth of Troy was the supervising architect. The resulting stone structure is 120 feet by 130 feet, with small towers placed at each corner and a central spire reaching 230 feet in the air. The roof of the spire is constructed of steel and glass and casts light on the sanctuary below. The interior is elaborately decorated in plaster and has a unique amphitheater style of seating. I visited this church with my parents in the early 1950's. I forgot exactly what city in the area it was located, but I never forgot the building. Probably the most incredible church that I was ever in. The exterior belies the beauty of the interior space. Recently a friend with Schenectady connections helped me locate it. You may be surprised to know that Frank Lloyd Wright designed most of the present campus of Florida Southern College at Lakeland, Florida. He also designed many of the campus buildings. Photographs shown in the following web pages were taken by me on May 31, 1999 while living in Centeral Florida. The FSU campus is also referred to as "Child of the Sun." The campus buildings at FSC represent the largest collection of Wright's buildings in one place in the world. For additional background information see: Wikipedia: Child of the Sun. Now just enjoy the pictures. Look for more of Essex in the future. When in Nashville don't miss this remarkable place.